Kris Aquino on meeting Michela Cazzola and her baby: "I prayed a lot for this day to arrive when we'd all be ready, because I just want what is best for my bunso." We all know it's quite difficult to grow up without a father. Things get more complicated when there's an issue between the mother and father. Things get worse when the family issues hit the headlines. But over time, some celebrity moms learn to set aside their personal woes for the sake of their kids. They become friends with their ex or estranged husband, especially the latter's present wife or girlfriend. Here are eight moms who have proven that what the society describes as "unconventional set-up" can actually work. Meryll Soriano married Bernard Palanca in September 2006. The two have a son named Elijah. They separated five months after their wedding. 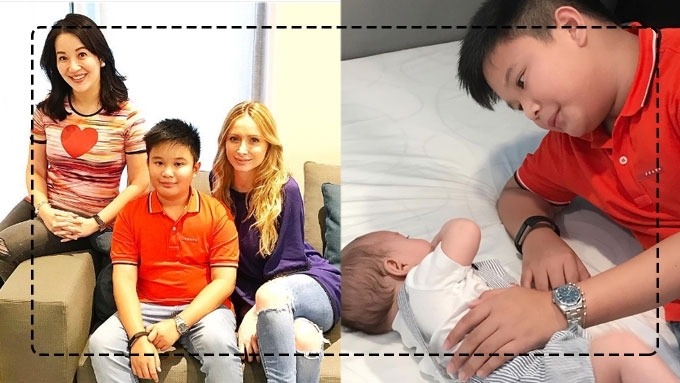 Meanwhile, Bernard found a new love in Jerika Ejercito, who gave birth to their son Isaiah in 2014. They called it quits in January 2016. Meryll and Jerika have remained friends since they were former schoolmates in OB Montessori. In one of her posts, Meryll wrote, "I treasure the parallelism of our lives. It is both funny and precious. I love you to the moon and back. And all I can say is... We got this, babe." For her part, Jerika greeted Meryll this way, "Thank you for being constant in my life and Isaiah's. You are exceptional in so many ways. "I couldn't have asked for a better co-parent to share this life journey with. I love you." The kids also have their regular play dates, even if only one of their "two moms" are present. Jodi Sta. Maria and Iwa Moto now how something in common. Both their beautiful kids are fathered by Pampi Lacson. It can be remembered that the two women in Pampi's life went through a difficult time after Iwa launched a tirades against the Kapamilya actress. But things have been well for the two. In 2013, Jodi reached out to Iwa, who then gave birth to her daughter Eve. In February 2015, Iwa posted a photo of Jodi, Jodi's son Thirdy, and Eve. She wrote, "Lord thank you for yesterday. Thank you for giving us the time to bond with @jodistamaria. Ang saya ni muy super na-miss ka daw niya Jodi:)"
Check out their recent bonding sesh. Nikka Martinez had just but one insecurity in her life after becoming Mrs. Patrick Garcia. In a blog post titled A Boy After My Heart, she wrote, "I was confident in mostly every thing except his past. "Knowing that he has a son whom he adores with someone he used to love, not to mention, a very good-looking person… brought about the feeling of INSECURITY in me." But through God's grace and with Patrick's love, insecurity was replaced by admiration after meeting Jennylyn Mercado in 2014. The celebrity mom shared, "I knew in my heart that this was definitely God’s plan. "God took away all my insecurity and replaced it with genuine admiration. "He took away jealousy and replaced it with compassion." Here's their very first family photo, Jen, her son Jazz, Patrick, Nikka, and her then-two-year-old daughter Chelsea, which was uploaded a few days before Christmas last year. Last months, Kris Aquino and James Yap's fiance Michela Cazzola had the chance to meet each other in person. The former visited Mic's place to fulfill Bimby's request of meeting his younger brother. Kris shared on her Instagram account, "I reached out to James and asked if it would be okay for Bimb to meet his baby brother. "I prayed a lot for this day to arrive when we'd all be ready, because I just want what is best for my bunso." In a separate post, Kris wrote, "There's no perfect formula for mothering except to do it with LOVE. "I am grateful that today we gave our sons the opportunity to meet and hopefully have genuine bonding as brothers... Because in the end, the good men we are able to raise will be products of our guidance and unconditional love as mothers." Bimby and Kris's eldest son Josh even went to Michela's birthday party. Original article first appeared on SmartParenting.com.